Here's a "SportMaster" in the new Transit passenger van. This monster setup fits like a glove. These are the coolest little vans. 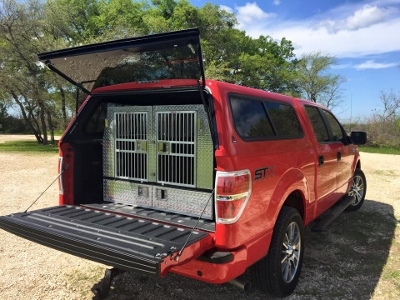 It will carry four dogs easily. They come in 5 & 7 passenger. This is a seven. Here's a "SportMaster" in the new Honda Odyssey minivan. 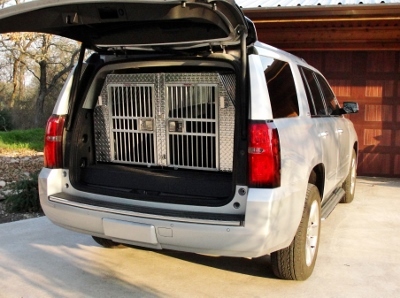 We can make this setup fit like a glove in your vehicle. If you're into dogs, then like me, you have more than one, and lots of gear to go with them. I like to have everything loaded and ready to go. This great setup allows you to do exactly that. And of course in a little bit of style. The GL line of Mercedes is another great SUV that offers you the comfort and style you want. Don't settle for wire or plastic crates. 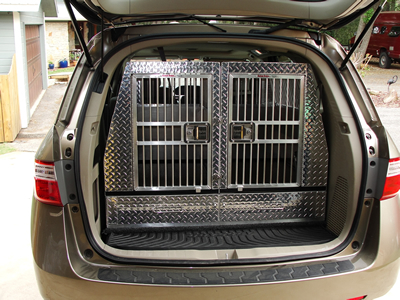 Get the crate setup that fits the quality of your vehicle. We take a lot of pride in what we build. It shows in our craftsmanship. Our crates are not only safe for your dogs, they are like a piece of art. Our Twin Rider looks right at home in this Mercedes ML. Call us about your SUV. 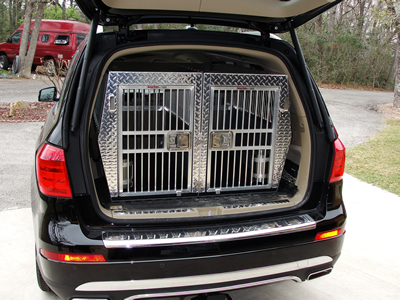 At Kustom Krates, our business is making your crate dreams come true. We build a setup that is not only dog friendly, but handler friendly as well. Our door latch works just like your car door. Just close it, and walk away. No loose dogs, ever! Kustom Krates are not just for SUV's. If you have a pickup truck and need crates, call us now. We have done lots of trucks and can build a setup for you. This particular Twin Rider was designed to go under the bed cover on a Chevy Avalanche. We also offer mount systems to secure your setup to the bed. The Toyota Sequoia has a cavernous cargo area. 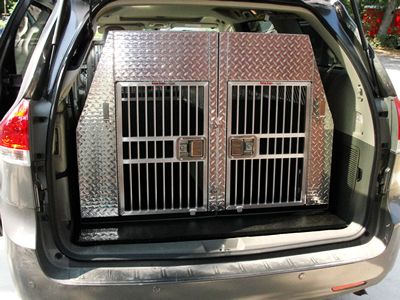 This customer dreamed about a two dog setup on top of a very custom built lower equipment box. He wanted lots of storage. We made his dream come true. 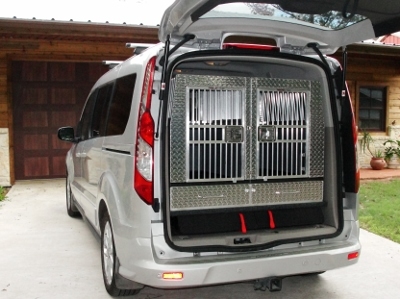 The Toyota Sienna has become a very popular dog car. 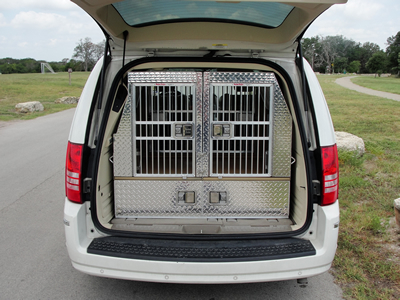 Lots of room for multiple dogs, people, and all your gear. Easy to drive. And one feature I like is the quarter windows still open. 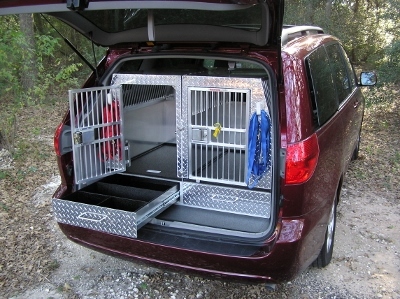 This has our "SportMaster" in it with leash hooks, roof vents, and sits on one of our super nice platforms. Got big dogs. We've got big crates. 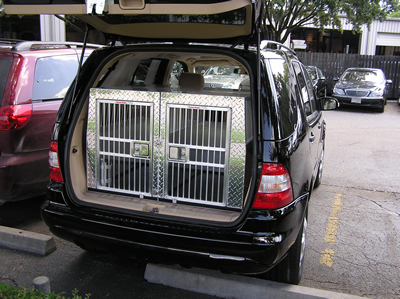 This customer has three large dogs and a Sienna minivan. So we super-sized our "Twin Rider". Crate on the left is even a little wider than the one on the right. Plus there is a monster Kustom Krate in front of these. Big dogs need big crates. We can't make your car any bigger, but we sure can use the space its got. The custom platform holds everything in place. Kustom Krates are all the rage. You just can't buy anything better. In this day and age of junk being sold, we hold to the highest standards of craftsmanship. 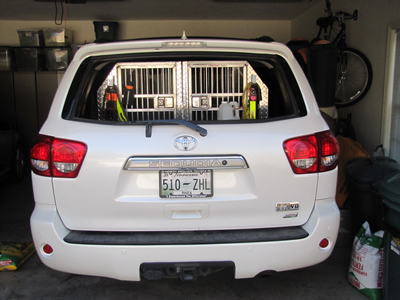 No sharp edges inside, slam style door latches, slide out pans for easy cleaning, and drawers to hold your gear. All completely welded to be dead silent. Now we're getting serious. We call this the "SportMaster Extreme" This is our SportMaster on steroids. The lower equipment box gets much bigger and is upgraded to our slam latches with all doors and drawers keyed alike. This particular setup also has a notch designed in it to fit around the electric hatch opener. This is serious!